Blue Wheel Press, LLC, 9780991170500, 388pp. 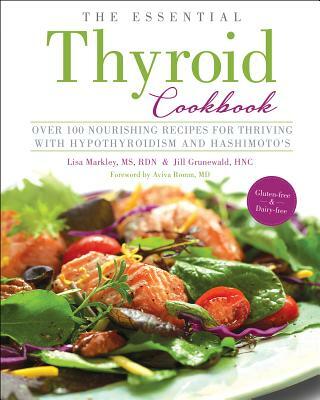 Lisa Markley, MS, RDN and Jill Grunewald, HNC have created a groundbreaking and scientifically supported cookbook for those with Hashimoto's (autoimmune hypothyroidism). It's masterfully written and will support you for a lifetime of peak thyroid health no matter where you currently are on your wellness journey. ​This long-awaitedvolume is a book within a cookbook - it contains a substantive educational component as well as over 100 original ''food as medicine'' recipes that not only satisfy and delight your taste buds, but also provide you with maximum nourishment for your thyroid and immune system and help you translate simple, thyroid- and immune-supportive nutrition to your plate. For anyone who has wanted to cook confidently for optimal thyroid and immune function, this is your definitive guide. Be prepared for more unfussy, artfully crafted, mouthwatering recipes and well-studied, reliable, non-dogmatic thyroid- and immune-supportive nutrition information than you've ever seen in one cookbook. Hashimoto's is the most common autoimmune disease and thyroid problems are among the most prevalent yet overlooked conditions that compromise women's wellbeing. (Additionally, men are being diagnosed in increasing numbers.) With their combined 20 years of nutrition and culinary wisdom, the authors have a mission to help those with Hashimoto's reclaim their health. Markley is a dietitian with over a decade of nutrition and culinary experience and Grunewald is an integrative nutrition and hormone coach who's been in practice since 2008 successfully guiding her clients and students with hypothyroidism and Hashimoto's to health and vitality. They've each experienced the challenges of Hashimoto's first-hand and have discovered that the most impactful way to reduce symptoms and improve thyroid and immune health - for themselves as well as their clients - is to focus on the sound nutrition strategies outlined in this cookbook. They took a rigorous academic approach to this cookbook. In preparation for the choices of ingredients, Jill and Lisa created a "nutritional springboard" that's the foundation for their recipes. They extensively researched the most supportive nutrients for the thyroid and immune system and then identified foods that are dense sources of these nutrients, which ultimately laid the groundwork for The Essential Thyroid Cookbook. This quintessential cookbook is a tour de force - a work of art and a work of science. It belongs on the shelf in every kitchen of anyone diagnosed with hypothyroidism and Hashimoto's. Lisa Markley, MS, RDN is a nutritional wellness expert with over a decade of experience working passionately towards improving the health of others. She has diverse experience in integrative nutrition, health education, clinical counseling, research, and community wellness. Lisa is also a seasoned culinary educator and recipe developer with a deep love of cooking, eating, and advocating for local, seasonal, and sustainably-produced foods. Her mission is to help others translate seemingly complex nutrition recommendations into simple, actionable steps using health-supportive ingredients prepared deliciously. Lisa began her education at Northern Arizona University with a Bachelor of Science in Health Education. Later, she received a Master of Science in Nutrition from Bastyr University in Kenmore, WA. She then returned to her hometown, Kansas City, to complete her Certificate in Dietetics from the University of Kansas Medical Center. As a lifelong learner, she has furthered her professional development with courses from the Integrative and Functional Nutrition Academy, the Institute for Functional Medicine, and Field to Plate. Lisa currently consults for the University of Kansas Hospital and Healthful Elements. She also teaches nutrition classes at Johnson County Community College and Turning Point: The Center for Hope and Healing. She has been featured frequently as a nutrition and cooking expert in the Kansas City media. Lisa knows first-hand the struggles of chronic illness. She was diagnosed with Hashimoto's thyroiditis in 2008, chronic Lyme disease in 2012, and mycotoxin illness in 2014. Lisa has successfully utilized a Functional Medicine approach to address her illnesses head-on. Therapeutic nutrition has been one of her greatest allies on her healing path. It's Lisa's desire to empower and inspire you to become an advocate for your own health and learn how to harness the healing power of food and healthful lifestyle changes.Jill Grunewald, HNC, Integrative Nutrition and Hormone Coach, is a thyroid health and autoimmunity specialist. For nearly a decade, she has successfully guided her clients with hypothyroidism and Hashimoto's to health and vitality. Since graduating from nutrition school in 2006, she has taken part in many courses lead by members of the functional medicine community. In early 2018, she'll graduate with a certificate from the Functional Medicine Coaching Academy, in partnership with the prestigious Institute for Functional Medicine. Jill has suffered from alopecia (autoimmune hair loss), off and on, since 1982 and in early 2008, was diagnosed with Hashimoto's. She knew that taking thyroid drugs "for life," with no consideration for why her thyroid was under-functioning or what to do about her immune dysregulation was not the answer, so she immersed herself in learning everything she could about autoimmunity and hypothyroidism and how to manage these conditions with whole foods, botanicals, lifestyle modifications, and other natural therapies. Jill's Hashimoto's remains successfully managed without thyroid drugs. And unlike many with alopecia, her bald spots always grow back. In her coaching practice, Healthful Elements, Jill not only specializes in hypothyroidism and Hashimoto's, but also other autoimmune conditions (especially alopecia and Graves'), adrenal dysfunction/HPA axis dysfunction, polycystic ovary syndrome (PCOS), perimenopause/menopause, and pre-diabetes/diabetes. Jill has written for various publications, blogs, and online magazines, including Huffington Post, MindBodyGreen, and Experience Life magazine and has contributed to articles in Self and Shape magazines. She lives in Minneapolis with her husband, Mark, and daughter, Harriet.